Yes, I’m afraid so, I have acquired another bike! Unexpectedly I must add. 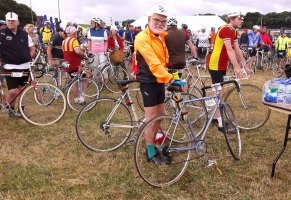 Regulars will remember that I have written in the past about my bikes and I have one, a French made Motobecane classic Road Racing bicycle (circa 1980) which I call ‘Captain Beaky’ and which was bought so that I could take part in La Pedals de Clip in Spain this year. 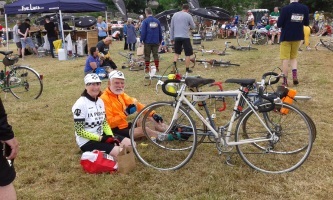 My husband and daughter both have English-made bikes from the late 1950’s and took part last year as well, but at the time I didn’t have a suitable bike. I really would have liked to also have English bike but classic English bikes are very expensive, especially in good condition. Finding one in need of refurbishment and therefore not expensive is a matter of luck, especially if you want a small frame. The French one, however, was affordable though a little on the top end of a suitable size for me. We did what we could to make it fit better and it is not bad, in fact it is a very nice bike, but all along I have said that if I came across an affordable English bike with a slightly smaller frame I would get it. So, while not exactly actively searching for one we have been keeping our eyes open. My husband recently made a visit to our local bicycle recycling charity ‘Back to Bikes’ in Stafford (they take in donated bikes, refurbish them and sell them at affordable prices. If they are not worth refurbishing they strip them for parts and/or scrap them). He wasn’t looking for a bike but saw this one and brought it home for me. It is in need of complete refurbishment and there is a good chance ‘Back to Bikes’ would have scrapped it. This bike, which I have decided to call ‘Bertie’, is decidedly smaller framed than ‘Captain Beaky’ and is English through-and-through. At the moment it is totally in pieces and restoration has commenced. We have bought some new (old stock) wheels of the correct era ready to replace the not-so-good old ones, plus new tyres. 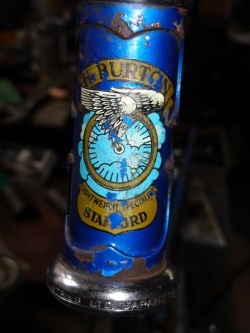 A dent in the top tube has been repaired and the frame is in the process of being rubbed down ready for re-spray. We have found some replacement old style decals to be stuck on once the repaint job is done and the aim is that I will use this bike for La Pedals de Clip next year. If our youngest son decides to come along too then he can ride ‘Captain Beaky’, with some adjustment back to its original state in order to fit him. Watch this space. I haven’t written anything about cycling for a while, but that doesn’t mean I haven’t done any. I must confess I am a bit of a fair weather cyclist though and lately it has been too cold, dank and miserable for me to go out much. Our rides have been fairly short, about 10 miles at most, sticking to main roads at quieter times (the lanes are just too mucky). Last time we went out I was wearing pretty well two of everything – including leggings! I have to say two pairs of gloves does tend to make gear changing a tad difficult. One thing I have noticed recently while thinking about more than actually riding is the number of bikes that we own between us. I have written before about mine, and shared pictures on this blog (no new ones today, sorry, but I am trying to get this post scheduled quickly as I shall be away for the weekend and back too late to post for Monday – ie today if you are reading it). I have, as you know, Captain Beaky (my Motobecane classic road racing bike), a clunky old Raleigh mountain bike and my more recently acquired Fifi (my Forme Longcliffe road bike) as a winter bike. 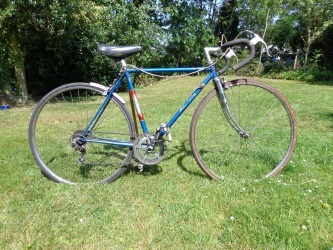 In addition I now have my son’s girlfriend’s lovely Raleigh Capri One road bike on loan. She has borrowed a mountain bike from him, hasn’t room to store both so we are storing it for her with her permission for me to try it out. It’s a super bike, fits me better than Fifi, being a slightly smaller frame, and I am going to be reluctant to give it back! 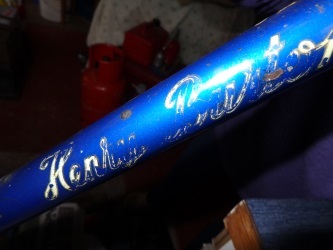 Now to my husband: he has his classic road racing bike – a Freddy Grub, for those in the know, dating back to the late 50’s/early 60’s and also a clunky old Raleigh mountain bike of the same era as mine. Recently he fished out an old classic road-race type frame that was in our barn (having been rescued many years ago from a ditch) and discovered it to be a Claude Butler of similar age to the Grubb. So he has now restored it and has ridden it a few times, however the frame is a bit big for him, though it fits our son quite well. 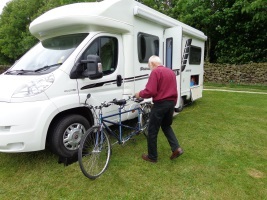 He has also since bought another Raleigh mountain-bike, not quite so old and full-suspension this time – a friend was selling it cheap and he can’t resist a bargain! So I have three, plus one on loan, and he has four. On top of that, as you know, we also have a tandem. Then there are a couple of folding bikes on board our yacht, for use in port when we have no other transport. That makes five and a half a piece. Our youngest son who lives at home also has several bikes (I haven’t dared count them), mostly mountain bikes, plus several more in various stages of renovation including at least one road bike. The bad news is that many of these are actually overwintering in our conservatory as they are probably better protected from the cold and damp, with the bonus that they are ready to hand when required. It does mean we can’t use the conservatory, but then it is a bit cold out there right now. At least most of the mountain bikes are down the garden in the shed. Thinking about owning all these bikes it does beggar the question – why do we need so many? Well, you know the answer to that already, we have discussed it before (read about it here) – you need N+1, where N is the number you already have.